← Dialysis and THANK YOU! Digital Journal had an news item from Warner-Robbins, Georgia about a woman awaiting a kidney transplant and her humiliating experience using her food stamps debit card at a local Kroger. She got into an argument with a cashier about some items that she figured should be covered by food stamps. His comment to her in front of the other customers in line was “Excuse me for working for a living and not relying on food stamps!” She said, at this point, she was so embarrassed that she broke down in tears. I understand what it’s like to be on food stamps; now referred to as SNAP for Supplemental Nutritional Assistance Program (I assume some bureaucrat is still patting him/herself on the back for that one!) The hoops you have to jump through with the state office that controls and decides who is eligible to get them is a tough group to work with. In my experience, I was immediately approved for one month’s allocation of less than $300 for three people. Then, I was unapproved and we got $150 for me only. My two sons were excluded from the program because they were over 18 and expected to be working. I appealed that decision and withdrew it when an agent called and put me back on for the full allocation because the boys are students. Then, I got a letter saying we were disqualified again because I made too much money. I had only unemployment at the time and that barely covered my rent and part of the utilities. Everything else came from my savings. So, why they thought I made too much money was beyond anything I could imagine. Once again, I appealed but this time I was resolved to carry it through to the end. When I questioned why I was considered to be making too much, the agent explained that I was expected to work and suggested I could sell stuff to make more money. They sent a huge multi-page document that detailed how they “calculated” why I made too much. Something was fishy about it. I read the small print and saw that the calculation was based on whether or not I was disabled. I had answered that question in the first interview with the SNAP people; yes, I’m disabled and I made that statement on the original questionnaire. This little fact would come to haunt them. About a month later, the appeal hearing was conducted by phone. Thank goodness I have an unlimited minutes plan for my phone. I did that because these calls to Texas Health and Human Services last hours! For what I had to pay in overage minutes, I could get unlimited minutes. So, I didn’t mind that it took nearly thirty minutes on the phone just to get started with the appeal process. It’s conducted like a courtroom hearing with all the people being sworn in. The first to testify was the person representing HHS. She went through a litany of statements and questions. Then I was asked to make my statement. I started off with my reasons for needing food stamps and my income that should make me eligible. As soon as I mentioned I was disabled, everything stopped. The hearing officer jumped on that right away. She began questioning the HHS agent. The calculation for income for disabled people is considerably different that for “able” people. Using the disabled formula, I was well within the parameters for eligibility. The hearing officer started asking some very pointed questions of the HHS person and I was almost embarrassed as she stumbled through her answers. When she had to answer that I had checked the box for disabled on the first submittal, it was all over. The hearing officer instructed the agent to revise the application and concluded the hearing quickly thereafter About a week later I got a letter saying I was approved along with my boys for another year. But I suspect that’s not the end of my long phone conversations with HHS and SNAP. After what I’ve been through with SNAP just to get and keep my food stamp card, I should be proud but that’s not the case. 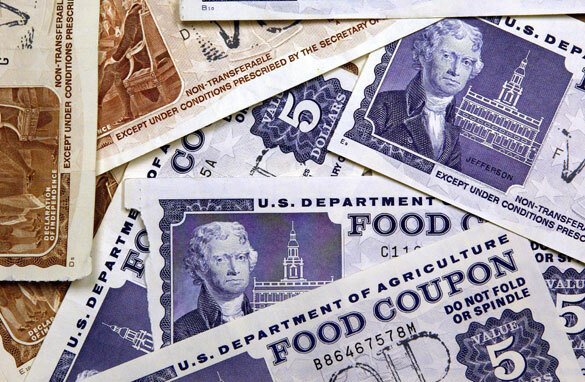 I’m still embarrassed when I pull it out to pay for my groceries. But, the simple fact is, I would not be able to afford feeding myself and my boys without it. It’s not enough, but it helps. So, the next time you think someone is getting away with “being lazy” or “not working” because they use a food stamp card, remind yourself that “but for the grace of God…” It could be you trying to live on very little and dealing with the state bureaucracy instead of that other person. This entry was posted in dialysis, discrimination and tagged dialysis, ESRD, patients, social welfare. Bookmark the permalink.